Since 1917, 86 novels have been awarded the Pulitzer Prize for fiction. We're going to read all of them, in order, in a single year. There are bound to be surprises in store for us - Pulitzer (Sur)Prizes, of course! Here you can keep track of our progress, share your thoughts on the books, and send us encouragement. I'm sure we'll need it! Thank you to the Pontiac Public Library in Pontiac, Michigan for keeping in its collection a copy of Margaret Ayer Barnes' novel, Years of Grace. Ms. Barnes' novel is the thirteenth novel to be awarded the Pulitzer Prize for fiction and I loved every single minute that I spent reading all 581 delicate pages of it. I thought for sure this book would be terrible. First of all, it's rare. Used copies on Amazon start at $40. 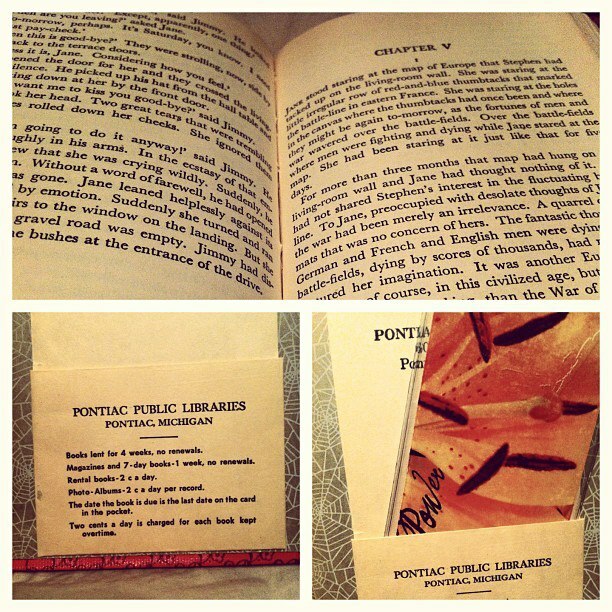 John K. King bookstore in Detroit had a copy for $50. If a notable, prizewinning book was actually worth reading, it wouldn't be so close to being out of print, right? Second, it's nearly 600 pages long. The only other early Pulitzer winner under my belt that approaches this length is Sinclair Lewis' interminable Arrowsmith, and it was 100 pages shorter. And terrible. Just... [shudder] ...terrible. So when my local library emailed me saying that the copy of Years of Grace I'd requested via interlibrary loan was available, I didn't exactly run to pick it up. Unimpressive in its generic replacement binding, the novel was fragile. The thin pages were yellow and brittle; despite my careful page-turning I still managed to rip so many that I eventually lost count. The spine was not in very good shape, I felt that whole chunks of pages could come spilling out at any moment. Also, it smelled musty. Like really, really musty. When I picked it up there was a little note listing the existing damage to the book that some diligent librarian had taken the time to document. The copyright date of 1930 was also the year of the first nine printings of the novel, all listed in the inside cover. Which made the book a cool 83 years old, and probably the oldest physical text I've ever read - except maybe for my mom's ancient, dust-covered, falling-apart, unabridged dictionary. This was not a book I could tote around in my beat up purse, pulling it out for an odd five minutes here (in line at the bank), or ten minutes there (getting an oil change). It was also hard to read in bed because of how brittle the pages were, and there was no way I could take it into the bathtub with me - a locale that even my Nook sees on occasion. So the fact that I started this book and finished it six days later is almost miraculous. At the beginning of this challenge I estimated that to finish all the books in a year (HA! ), we'd have to maintain a pace of 94 pages per day. (That was funny, I was so young then, in May 2012 when we started this. But I digress.) I averaged 97 pages per day for this novel, and it completely consumed every spare second of my life. Years of Grace is the story of a girl named Jane Ward growing up in Chicago at the turn of the century. We meet Jane in the late 1800s, when she is just fourteen, and leave her when she is in her fifties, and her modern Jazz Age children are throwing her for a loop. The novel is divided into four main parts, and we eventually learn that the first three parts are named for the great loves of Jane's life, with the final book named for her children. Jane falls in love with André as a young girl. Her parents do not permit them to marry and separate them, telling André he is not allowed to contact Jane until she turns 21. He returns to his native France and Jane goes to Bryn Mawr for two years, before returning home to make her society debut at age 19. While Jane is waiting to turn 21 she meets Stephen, who falls in love with her almost instantly. She refuses his first proposals, clearly she is waiting to see if she hears from André, but Stephen proves himself to be a patient and loyal and trustworthy companion. And he is persistent. While Jane is still waiting for André and begins considering Stephen, some other things happen in her small social circle. Someone has an affair, someone else gets married, and someone else commits suicide. Jane is starting to notice that adults in love do not always behave as they ought. When she does finally hear from André he writes to tell her that he still loves her, and wants to see her, but he must accept a prestigious sculpting apprenticeship that will delay their reunion for another year. Jane will have none of this, decides she's waited for André long enough, and consents to marry Stephen almost immediately. "She would wear her prettiest dress for Stephen. She would tell him at once that she would marry him. She would try to make up to him for the way she had treated him. What if Stephen, discouraged, had forsaken her? Jane felt an overwhelming sense of gratitude for Stephen's faithfulness. She had never appreciated it before. Of course she loved him. She loved him and she would marry him." Even now I remain unconvinced that she actually loves Stephen at this point. She cares for him, surely, but does she love him? Or does she just appreciate that he was (unbeknownst to him) a dependable matrimonial backup plan? Is she settling for him? That's never a good idea. Or is it? Considering my misgivings at the close of the second part of Jane's life, I was not at all surprised to start the third part of the book and immediately discover that, fifteen years into their marriage, Jane is bored. The third part is titled "Jimmy" and from the first page I was just waiting to meet him. He would be the next man that Jane falls in love with! The suspense was killing me, so imagine my surprise when Jimmy turns out to be her best friend's charismatic husband. Oh NO! This was the most heartbreaking part of the novel for me. She genuinely loves her friend Agnes and does not want to hurt her. She still loves (and is married to) Stephen, but she is dreadfully, painfully bored. There is a scene in which she is appraising her looks in the mirror before bedtime, longing for him to see her as a desirable woman, as an object of his passionate affection once again, after fifteen years of marriage and three children together. But she knows that he will not. Barnes writes, "Poor old Stephen - he looked very tired. As for herself, from the nature of his smile Jane knew what she looked like. There was absolutely nothing to be done about it. She looked like Jane." At any rate, I highly recommend this book. Even if it is hard for you to locate, it's worth the effort. Next up is Pearl S. Buck's The Good Earth. One of the more famous of the early Pulitzer winners, I hope it's famous for a good reason. Interestingly enough, it takes place in China and features all Chinese characters. This breaks tradition with most of the other winners, as the prize is typically awarded to stories that deal with American life. Also, you should friend me on Goodreads. Hello. Howdy. Hey. How do I describe myself? Like Maria, I'm 30 years old and grew up in the 'burbs of Detroit. One of my degrees says I should get a PhD in history. Another one of my degrees says I'm a librarian. My resume says I'm a lifelong entrepreneur. My mother says I'm a free spirit. I say I'm just a nerd who enjoys making lists, cooking food (but not eating it), making money (but not spending it) traveling, sweating, and studying foreign languages. I also like getting into pointless and snarky arguments on message boards and blogs. I promise to try to avoid doing that on this blog to the best of my ability.